Recommendations are the new black… err.. ratings. You know what I mean. I’m sure most of our regular users have noticed the new Recommendations feature that I soft-launched throughout the site a few days ago. As was kindly suggested by our beta testers, a blog post is in order, if only to give you all an idea as to how recommendations work, and why you should use them. You can only recommend any individual work once. You can’t recommend your own works, the same way you can’t rate your own works. Recommendations aren’t meant to replace ratings at all; they work in tandem with them. Unlike ratings, however, you can only recommend an entire work — that being a story, poem, writing exercise, or other work on the site. I spent a good deal of time discussing the ratings concept with our beta tester group prior to building the feature, so we managed to refine the functionality to — in my opinion — be a lot more interesting and useful than your typical ratings. By default, you’ll be presented with a list of popular reading recommendations, tailored to you, from authors on the site that you follow. 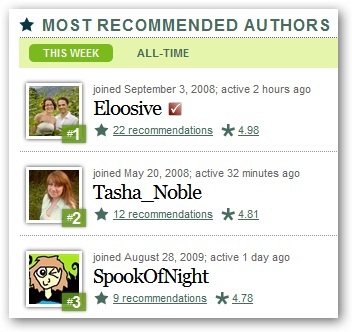 Of course, to see this list, you’ll need to follow a few other authors on the site (by becoming a fan of their work). If you’re not following anyone, you’ll see the site-wide recommendations for the week by default. There are also, as you may have noticed, toggles to switch both displays between “This week” and “All-time” modes. More of these modes will likely be added in the future. If you want to improve those recommendations, following other active authors on the site whose works you enjoy will only help to provide you with better (and more diverse) recommendations. You can check out our related FAQ entry for more details. Works on the site and author profiles will also display the number of recommendations about them in the popularity box in each case. Also, you’ll notice the (slightly revamped) Authors landing page has a new Most Recommended Authors box at the top of the page. 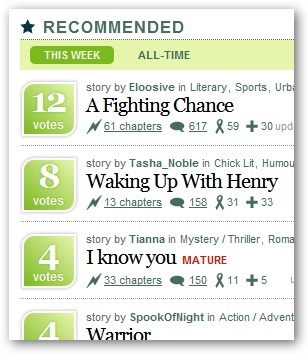 The Most Recommended Authors listing is updated every few minutes. Finally, you’re probably asking yourself “so, how do I recommend works?” — well, that’s very straightforward, too. 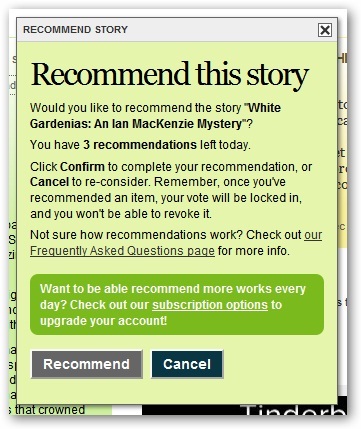 Clicking the Recommend button will pop up a dialog asking you to confirm your recommendation. It’ll also let you know how many more recommendations you have left for the day, and when they’ll refresh. Regular site members are limited to 1 recommendation a day. Protagonize subscribers have additional recommendations each day, with Pro account holders getting 2 recommendations, and Plus subscribers allotted 3 recommendations. If you want to upgrade your account prior to the official launch of subscriptions, you can do so via our Donate page. Once you’ve recommended the work, the button will update. Make sure you’re sure about your recommendation, because you can’t un-recommend something later. Recommendations are about enhancing the quality of works promoted on the site, via the community. The goal is both to make your reading experience better, and to help recognize authors on the site who produce high-quality writing. 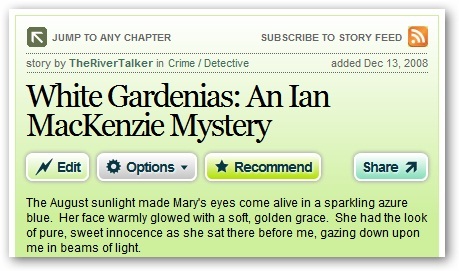 In addition, it gives you, the reader, a way to let others know about interesting, well-written works that you’ve enjoyed. I’m hoping everyone hops on the recommendation bandwagon. Enjoy the new feature! This entry was posted in General, Site mechanics, Site updates and tagged quality, ratings, reading, recommendations, reviewing, writing. Bookmark the permalink.